Creative play for toddlers is so important and easy to do. 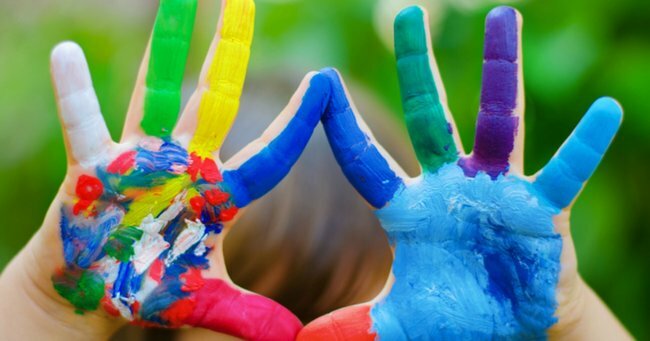 9 ways to turn your toddler into a creative little champion. I’m not one of those parents who remembers specific details of my children’s milestones, but I specifically remember the day my toddler daughter put my brand new phone in a glass of water because I remember eventually thinking – after silently screaming inside my head – that it might be time to stock up on some new toys for her. Obviously she’d outgrown the traditional baby toys (and was obviously done with my phone), so we headed to the local toy store and chose some toys she’d be happy to play with, that could teach her something but most importantly, that could foster her creativity. 1. Buy a toy phone. Obviously step one for me was to buy her a toy phone, so that she didn’t get her sticky little fingers on my replacement phone. I still can’t quite believe she did that to my phone. She’d been walking around holding it and I think she was just finished playing with it. Putting it in the glass of water was just an interesting way for her to put it down! It’s much better letting her play with a teeny-tiny toy phone, which we found in a LEGO DUPLO pizzeria set, than wreak havoc on mine. You may not be familiar with the concept of sensory toys but they are basically any toy that is tactile that toddlers enjoy the feel of. Think of those story books about animals that have samples of how the different animal skin feels. Bricks are tactile because your toddler has to feel their way around them in order to learn how to make something from them. 3. Letting her make a mess. This took some time for me to come around to but I realised the importance of letting my toddler make a bit of a mess, in certain areas of the house. When she’s playing, it’s OK to spread the DUPLO around the floor. And I don’t mind her getting her hands dirty with washable substances such as non-toxic paint. Dirt and mud are also highlights, and once she played with a bag of flour which she carefully spread all over the kitchen…fun times. Caterina and Giovanni busy with DUPLO, a favourite from years past. Image: Provided. I already had a lot of DUPLO from my first two children - boys - but I felt Caterina, who was three at the time, deserved some brand-new, fresh, unused bricks of her own. Caterina loved her DUPLO and would even bring favourite pieces into the bath with her, using them as little cups for bubbly water and then drying them off to build another construction. Creativity and hygiene...that&apos;s a win. The outdoors is an incredible adventure playground for toddlers and they love nothing more than to explore and observe. We used to go for walks together and Caterina would bring a little bag and fill it with "treasures" she found along the way such as fallen leaves, flowers, twigs, gumnuts, and she&apos;d play with them when we got back home. Letting your toddler cook with you adds about two hours of prep time to cooking a meal but they also really love it. A great idea is to let your toddler help with one job and then give them a bit of food to play with, like some olives to cut up or some pasta to play with. Caterina loved DUPLO as a toddler, and still loves it to this day. Image: Provided. 7. Doing art with her. My daughter is a little artist and has spent hours creating since she was really little. While she was happy enough to do this on her own, I really enjoyed sitting on the floor and doing it with her. We&apos;d buy all sorts of materials and use them creatively. In fact, according to my toddler daughter, you only need a clothes hanger and some hair ties to make a pretty piece. She&apos;d get a plastic clothes hanger, some pegs, hair ties, the cling wrap and before I knew it she&apos;d made something... A mobile? A dream catcher? I still don&apos;t know what they were meant to be. 8. Letting her use my handbag as a toy carrier. There&apos;s a lot of random objects in my handbag which comes in handy when you are left waiting for 45 minutes at the local medical centre, or you&apos;re trying to have coffee with a friend at a local cafe with a wriggling toddler. Thankfully at that age everything was a toy to her. 9. Involving her in the process. Whenever I was stocking up on new items for my daughter I tried to involve her in the process. First she wanted everything to be glittery. Then she was quite into anything that was purple. Then she wanted things that were glittery purple. Then it was all about pipe cleaners. Whatever she wanted was fine by me, as long as she was stretching her creativity and thinking outside of the box. Top baby names and what they mean. How are you helping your toddler foster their creativity?